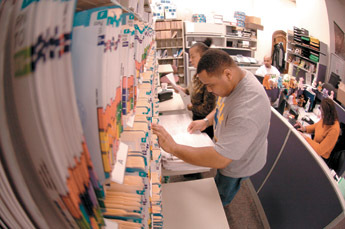 Shorter sort through College applications. While the mustard question, and its responses, may have absurd elements—one applicant described immersing herself in the “yellow goop”—Chicago’s essays are serious business for both candidates and Admissions officers, an angle that often gets lost in periodic press reports mentioning the famously kooky questions. “You have to give the context, or it just sounds silly,” explains Admissions Dean Ted O’Neill, AM’70, citing a December 20 U.S. News & World Report piece that ignored the mustard question’s aim. But for a University trying to raise its applicant pool, increased media attention also has its upsides, helping spread the word about Chicago’s unique brand of education. Applications have more than tripled since 1984, when the quirky questions were introduced, and now, O’Neill says, some students apply because of them. The approach isn’t for everyone. Some 255 schools, five in the Ivy League, have adopted the Common Application, a standardized form that asks traditional essay questions (e.g. “Indicate a person who has had a significant influence on you, and describe that influence.”), though many require supplemental information. That’s good news for Chicago, which wants to stand out. The umbrella approach, O’Neill argues, “obscures differences, a mistake when it comes to helping students think about you.” (Hence the College’s aptly named Uncommon Application.) Chicago’s essays help Admissions readers better understand applicants, he believes, and how they play around with ideas. A 1997–98 question charged students to create an essay that, among other criteria, incorporated a new pair of socks, a historical landmark, a spork, a domesticated animal, and the complete works of William Shakespeare. Uninspiring questions lead to uninspired answers, O’Neill says, and besides, better essays are more fun to read. The mustard question and others on this year’s application—addressing linguistic identity and Martin Luther King Jr.’s “Letter from Birmingham Jail”—mark 20 years of unusual topics. “We had a sense that we had a different kind of application pool,” O’Neill explains of the switch. The first questions were developed in a series of “endless meetings,” he recalls, though the staff enjoyed the challenge. These days the Admissions staff keeps things fresh by inviting admitted students to contribute questions, a practice begun four years ago. While some essays generate excitement, O’Neill admits there have been duds: policy questions that push applicants to write what they think Admissions officers want to hear; “improv” questions, including the one asking students to combine disparate elements, which often force humor; and questions that invite stock answers—the mustard essay, for instance, garnered a glut of commentaries on consumerism and American greed. In a book entitled The Mind’s I, by Douglas Hofstadter, philosopher Daniel C. Dennett posed the following problem: Suppose you are an astronaut stranded on Mars whose spaceship had broken down beyond repair. In your disabled craft there is a Teleclone Mark IV teleporter that can swiftly and painlessly dismantle your body, producing a molecule-by-molecule blueprint to be beamed to Earth. There, a Teleclone receiver stocked with the requisite atoms will produce, from the beamed instructions, you—complete with all your memories, thoughts, feelings, and opinions. If you activate the Teleclone Mark IV, which astronaut are you—the one dismantled on Mars or the one produced from a blueprint on Earth? Suppose further that an improved Teleclone Mark V is developed that can obtain its blueprint without destroying the original. Are you then two astronauts at once? If not, which one are you? —A favorite reissued in 2004–05 from 1984. Each new incarnation of Survivor makes us wonder about this thing called television and these creatures called human beings. But we want to set aside those big questions and ask you to play a bit for our shared enjoyment. Use your imagination to produce a version of Chicago Survivor. Use as your location the lush Gothic campus, laboratories, libraries, gymnasia, and residence halls of a Major American University. Establish a setting, make your rules, identify some players (select from all of human history), and take us through a trial and its results. Profundity will be rewarded and true wit will certainly count in your favor, but too much intimate familiarity with the actual show may be a strike against you. —A 2002–03 question inspired by Jonathan Shepard, SB’04. —A 2003–04 question inspired by Emma Ross, ’07.